Off the beaten path YET close to the quaint town of Hayward... the drive "out" is part of the fun... Lake home is spacious, semi-secluded and comfortable ... 3 BR/3 BA, 2 family rooms, 2 fireplaces, 2 spacious decks...Great island views! Tree lined shoreline with sand bottom swim area & great fishing... on 1300 acre Tiger Cat Chain of 6 Lakes... great wildlife & kayaking...girls/golf getaway! ... Great fall/winter hideaway, too -- ON snowmobile trail 14&19, close to Birkie XC Ski/Mt. Bike Trails & ATV trails.... and great road biking, too! ! HIPP'S HIDEAWAY has something for everyone. Great for R&R. Soft adventures abound. Besides good swimming, fishing, canoeing, kayaking, mt biking, road biking, hiking, cross-country skiing, snowmobiling & golfing.... we also have access to great shopping, restaurants, antiquing, etc. We are right on Fall Color Tour #1! Bring your boat or rent one. Boat landing with ( swimming hole and rope swing ) comfortably close! Boat ramp/ dam/ swimming hole & swing = easily walkable + easily boatable. Cabin rental includes use of our 2 Canoes, 1 kayak and 1 paddle boat-- you don't pay extra for anything here ! These are great for exploring chain of 6 lakes & interconnecting waterways (think 'Wisconsin Everglades'...) Or portage around the dam for access to another wildlife area! LAKEHOME DETAILS: 2 level, cedar sided. Upper level even with driveway, wrap around deck. Lower level closer to lake w/large 20' x 40' deck w/seating & a porch swing. Medium elevation (ie. great views)... There are 35 meandering steps to lake from the lower level. THINK ABOUT THIS IF YOU HAVE KIDS OR ELDERLY GUESTS in your group. It's generally not a big deal -- but know that we are not level with the lake. INTERIOR: 2200 square feet. Decorated in up north themes. Upper level has a great room with fireplace, wraparound couch, dining area & kitchen all overlooking lake. Master bedroom & bath, guest bedroom and main bathroom are also on 'upper' level. Lower level walkout has large family/TV/game room + bedroom with queen bunk beds, a laundry room and a spacious bathroom. There is one pullout couch in the lower level rec room. LAKE/AREA: Lake home sits on 2 wooded acres on 200 acre Tiger Cat Lake... which is part of the 1300 acre Tiger Cat Chain of 6 Lakes. Tree lined frontage with a sand bottom swim area & lakeside fire pit. Great fishing lake! Great place for active adventures or to kick back and relax. Short on-site trails through the woods. We are close to Birkie trails (miles of groomed grassy trails through rolling hills) Basketball hoop in driveway, horseshoes, foosball and board games galore. 300+ videos & DVD's (kid/classic/family/action/romance). Yes we have a video player ! We were determined to invest in an area that would welcome us AND our guests, and Hayward fit the bill. There are tons of things to do right at the cabin, nearby, or in town. Great dining options abound. The superior water clarity into the fall, the sand bottom frontage, and the varied woods surrounding the property kept drawing us back. Well paved backroads for walks and biking. Fun chain of lakes to explore +++ great fishing. Cabin comes with 2 canoes, a kayak and a paddleboat. Rent a stand up paddleboat in town! Free evening concerts featuring the loons, accompanied by the bull frogs. Crickets will chime in as well. Suggested finale is to finish off your concert experience watching the dance & crackle of a lakeside campfire and take in the visual array of the evening stars and moon against the pitch black sky... Bring your flashlight it gets pitch black dark if there isn't a full moon ! toilet, tub, shower, Large Maste Bathroom with walk in shower and oversized tub. toilet, shower, Lower Level -- roomy -- Walk-in shower. Kids favorite. 3 bathrooms! All good sized, too! MAIN BATHROOM for 'common' use = Full bathroom on main floor across from guest room with tub/shower combination...& toilet, sink/mirror of course :). Decorated in fishing theme. MASTER BEDROOM = Full bathroom with has separate oversized tub and walk in shower. Decorated with fish mosaic ! LOWER LEVEL BATHROOM = Spacious ! Walk in shower, toilet, sink, mirror, bench. Woods theme. Winding tree lined roads.... Color Tour #1! From upper and lower decks, great room and rec room! Medium elevation, 35 meandering steps to lake. Lakeside firepit and hangout area. Great views and semi- private. Bring long distance calling card or use internet. Cell phone use variable/sketchy/unreliable. Yes ! Plus spares in closet downstairs for pullouts, etc. TWO! Gas corner fireplace downstairs- Old fashioned metal w/stone base, Natural wood fireplace upstairs -- stone and log mantel. Yes -- service speed varies. Combined living/family fireplace room .. .opens to dining room & kitchen. One up, small one down. Mr. Coffee -- Filters provided! Flows into dining room and great room. Kitchenette downstairs w/sink & small refrigerator. Overflow can easily fit in wrap around couch in living area, too. TV for playing DVD/VCR movies only. No TV signal. Game area within rec room. Foosball table. Foosball table and 10 board games. Games, puzzles, 500 green army men. 300+ family friendly classic movies in library, plus 20 rated above a PG. Grassy area near driveway for playing tossing games. Upper deck is a balcony. Quiet and serene. Near soft adventures, great restaurants, and a funky town. On the skirt of the Chequamegon National Forest. Need I say more? Fall colors were spectacular - house was roomy and spacious ... enjoyed every day regardless of the rain or coolness. It was incredible to be able to hike down the roads - see the changing foliage and never need to move for a car. Deck view was a favorite too. Went canoeing three days on the lake - peaceful and cathartic - excellent lake canoe to use. Definitely a great time. Set a distance from the lake with a secluded feeling. Everything was as we expected! We had a wonderful stay at Hipps Hideaway! We spent most of our time fishing, and swimming by the dock. The cabin was perfect for our family! Nice place, plenty of room, lots to do, lovely lake, the week went to darn fast!!! This is a Great Rental. Communicating with the owner and property manager was wonderful! Stayed for 5 days with my group and every thing was SUPER! 3 bathrooms is wonderful when you have a group. 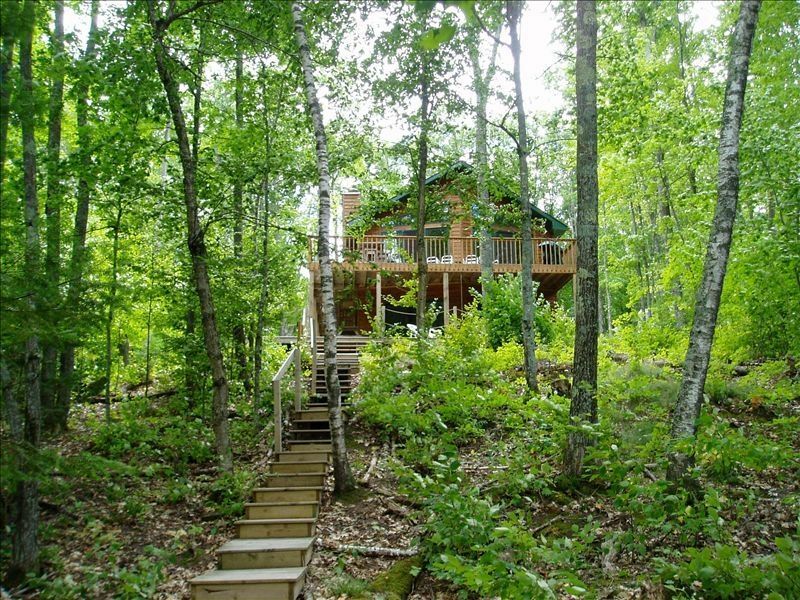 The setting is very senic and the location is away from highways and gives you that Up-North Wisconsin adventure. Thank You Shawn! Very nice property,just as described. This is our third time to stay at Hipp's Hideaway. We love to stay here in the fall surrounded by the beauty of nature 🍁� It's quiet and relaxing out on the deck looking at the night time sky 🌌� and coming in to a warm cozy fire 🔥�makes for a perfect night. I'm certain we will be back again. Thank you.